A bespoke yardramp installation from Thorworld Industries, utilising an existing concrete ramp as part of its construction, has helped one customer to remove trial and error from its loading operation for enhanced safety, speed and efficiency. Special features: Fitted upto existing concrete approach ramp. With 1,000 litre drums being loaded daily onto trailers, the company required a robust yardramp solution that was not being achieved with its previous set-up. A mobile yardramp had already been in use for several years when a section was removed for use elsewhere in the factory. This necessitated the building of a permanent concrete ramp, onto which the yardramp was adjoined – an action that turned a mobile solution into a fixed one. Faced with the option of either overhauling or replacing its existing solution, the customer favoured the latter, realising that advances in yardramp technology would enable the company to install additional safety features for the protection of loading operatives, as well as increasing loading/unloading efficiency. Thorworld was invited to devise a bespoke solution tailored to the customers’ requirements. This represented an unusual technical challenge, because the customer had deemed that removal of the existing concrete ramp would cause unnecessary downtime. Thorworld therefore had to incorporate this into the new design. The primary component of Thorworld’s solution is a cut-down version of its best-selling 10 Tonne, Type 6 yardramp, fitted flush with the concrete for a consistent gradient. 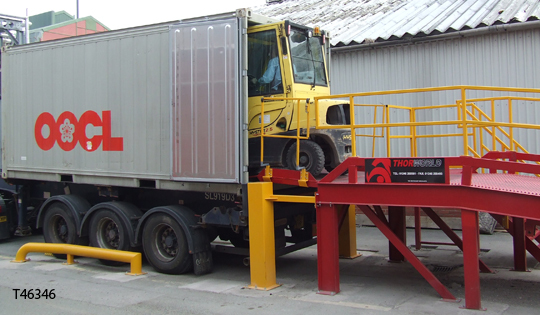 For loading operations, Thorworld recommended the use of a cantilevered drawbridge leveller with collapsible handrails - providing enhanced safety and efficency. The leveller drops down to trailer height when needed, but when not in use is stored in the upright position. 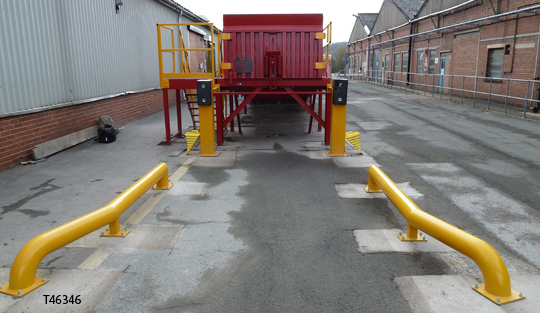 In tandem with the handrails, this secures the ramp to prevent forklift trucks or operatives falling off. At ground level, highly visible alignment curbs and bumper supports provide a guide to lorry drivers to ensure that they move into the optimum position for loading. Installation was completed in a single day, minimising bottlenecks in the company’s logistics. Thorworld’s system has been an instant hit with operators. 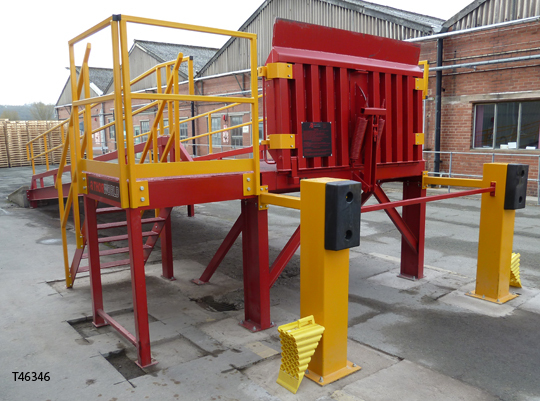 “The switch from pumping a hydraulic ramp to the correct height, which was time-consuming and involved an element of guesswork, has been replaced by the simple matter of backing a trailer into pre-defined position and dropping a drawbridge leveller into place. “Even on a basic safety level, our team has reported benefits. The gradient is shallower and the grip stronger so that forklift operators can drive confidently without risk of sliding.